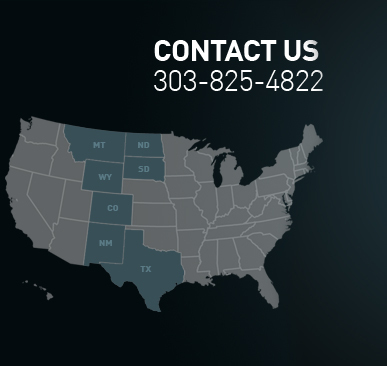 KDC provides complete drilling services in the DJ Basin and surround areas. KDC Rig #1 is a 250k# rig capable of drilling vertical and slightly deviated wells. 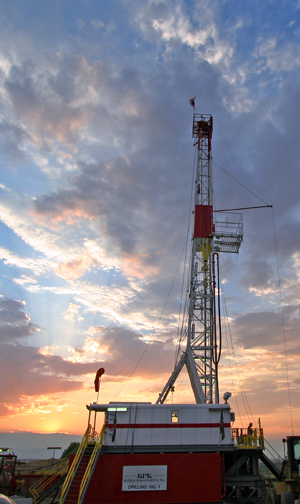 KDC Rig #2 is a 17,000' 600k# triple, built to purpose, horizontal capable rig. Power: 60 Series Detroit 650 hp with Allison 955 torque converter. Derrick: 97’ Butler Parks. Rated at 250,000#. 8 lines @ 1 1/8” with stand. Pump: National H-850 Duplex, Mattco fluid end. Gear end reconditioned by Klinzman Machine, Sterling, CO. Powered by Cat 3412. Rotary Table: 17 ½” Ideco with split master bushings. Generators: 1-225 KW powered by Cat 3306 B. 1-250 KW powered by Cat 3306. Air Compressors: 1 Quincy compressor with 10hp electric motor. 1 Ingersoll Rand UP6-10-150 Screw Compressor. Well Control: 11” 3000# Reagan Annular, 4 station closing unit with dual air pumps. 5000# choke manifold, 7 valves with 2 adjustable chokes. Mud System: 2 mud tanks with 600 barrel capacity. 1-Vortek Fluid Systems Shaker Orbital 3000M. 1-5X6 centrifugal pump for circulating and mixing mud at the hopper. Fuel Tank: 2500 gallon capacity with 4 separate oil bunkers and fuel transfer pump. Doghouses: Top doghouse: 30’ X 7’ X 9’, insulated, drillers lockers, shelving, cabinets, knowledge box and benches. Bottom doghouse: 40’ X 8’, one half is changing area for the hands with 16 lockers and benches, other half is parts room with work bench and electric heater. Drill Pipe: 7000’ of 4 ½” Grade E 16.60# XH in baskets. Slips: 4 ½” pipe, 6” collar, 9 5/8” casing. Subs & Breakers: XH handling subs, bit subs 12/1/4”-7 7/8” bit breakers. Miscellaneous Equipment: Mouse hole, rat hole, 2 sets of pipe racks (30’ long), complete set of stairs for rig, complete electrical for rig, complete winterization for rig (custom made tarps). Spare Equipment: Extra drum for Drawworks including break bands, spare pump parts. © 2017 K.P. Kauffman Company, Inc., subsidiaries and affliates. Development by JVK Web Developers, LLC.